Home »What Does Your Oriental Rug Say About You? 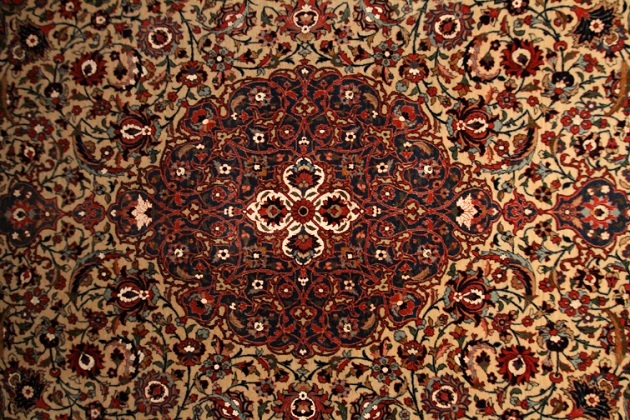 Most handmade Oriental rugs tell a unique story with their designs, whether this story is about the artist, the location where it was manufactured, or specific cultural narratives or religious statements. Yet, a handmade rug can also tell a different kind of story—one that says something about the owner rather than the rug itself—and allows you to peer inside the hearts and minds of every rug collector. When I first became interested in Oriental, Persian and Turkish rugs, it was several years after I had spent some time pursuing my education and other interests. My family had been involved in the rug industry for years, but at the time I was more interested in learning about computers and science than I was in participating in the family business. Before I finished attending college, my feelings about being a part of the rug business began to change. Whether it was due to my evolving tastes in the arts or a simple lesson in becoming an adult, I began to really get a grasp for the true beauty behind these exquisite, handmade masterpieces and everything they offered. As a result, I officially made the transition into being a rug enthusiast—and it wasn’t long before I was fully committed to helping others explore their own passion for Oriental and Persian rugs. In 1976 I started my own family business, Ahdoot Oriental Rugs, as a way of making handmade rugs more accessible to the public. During that time, Oriental rugs were thought of as something that only high society could be a part of. But the truth was, there were a lot of people who appreciated the fine handiwork of rug weavers, as well as the unique colorings and designs, that came from all walks of life. Meeting these individuals, couples and families over the years has taught me one thing about the handmade arts—and Oriental rugs in particular—it is that anyone can be part of the worldwide rug collecting community. All it takes is a love for rugs and, like any hobby, a little patience in learning where to find the most beautiful rugs in New York City and beyond. So when you finally find your first rug, or you’re merely adding to a growing collection, what does having this interest really say about you? Here are just a few characteristics I’ve seen in other enthusiasts over the years that could very well apply to you as well. No matter what industry is being discussed, today’s consumers have a deep interest in finding out what their purchased item consists of, whether it’s food, clothing or anything else. For most rug enthusiasts in particular, this means knowing what kinds of materials went into the creation of their Oriental rug. From a rug’s wool to its dyes and knot count, rug collectors often spend a great deal of time educating themselves on what to look for in terms of a rug’s quality, and usually won’t settle for a mediocre carpet. Modern rug-making has taken an interesting turn over the past century, as many rugs that are available on the market today were mass-produced by industrial machines housed in large commercial shops. Discerning rug collectors know to avoid these types of rugs altogether, and instead look for rugs that are both handmade, as well as made from materials that were sourced locally from nearby sheep herds and those who create natural dyes. One of the more unique things about Oriental rugs is their extensive history, which crosses thousands of years, dozens of countries and generations of families living in small villages. Depending on the type of design you’re most interested in, your piece could emanate from places like China, Egypt, Europe, India, Peru, Northwestern Iran or countless other locations across the globe, and give you access to a culture and community you might otherwise be unaware of. Over my 40+ years in the rug industry, it has been these three things that have consistently been part of the magic I’ve been able to witness in both my clients and fellow rug enthusiasts. And it’s this kind of magic that has furthered my own fascination with Oriental rugs.